European Existentialism is a rich collection of major texts and is made all the more significant by the range and depth of its contributions. This book aims to give greater intelligibility to existentialism by providing samples from antecedents of and influences upon it. Although existentialism is regarded as an example of twentieth-century philosophizing, the book presents nineteenth-century thinkers such as Kierkegaard and Nietzsche as its forerunners. Thinkers, such as Dilthey, Husserl, and Scheler, frequently associated with other trends hi philosophy, such as historicism and phenomenology, are included because of their influence upon existentialism. Informative biographies of each author represented are also included. European Existentialism includes a broad range of philosophers working in the existentialist mode—not only French and German, but also Spanish, Italian, Jewish, and Russian philosophers. This volume is also distinctive in that it omits existentialists from the literary world. While Dostoevsky is often included in other existentialist collections, Langiulli represents Russian philosophy with a selection by Berdyaev. In his new introduction, Langiulli discusses how the themes of existentialism have led to contemporary aberrations. He uses the language of political rights as an example; whereas we once referred to "freedom of speech," we have transformed that phrase into a much wider category, "freedom of expression." 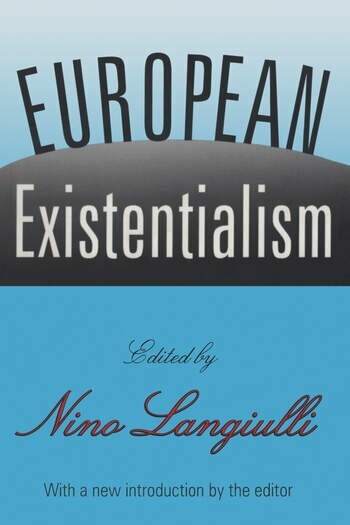 Langiulli also examines various trends that have derived from existentialism: postmodernism, deconstructionism, and multiculturalism. Langiulli's introduction and the contributions place existentialism as a genuine tradition in the history of philosophy. European Existentialism is an invaluable collection for philosophers, educators, and all those interested in the existentialist tradition.